As the oldest Hawaiian island, Kauai is filled with so much history and culture that there are few places on the island that don't connect to traditional Hawaiian heritage. If you can look past the stunning vistas and countless natural wonders, you'll discover the rich history of the island’s people. With 10 miles covering a 5 million-year timeline, I knew that hiking the Koloa Heritage Trail would be a highlight of my Kauai visit. The sites are scattered all over the island so it actually took me three days to see most of the monuments. There are 14 stops on the trail and I ended up viewing half of them, usually by bike, but hiked when a path became too daunting for cycling. My first stop was Spouting Horn Park, which features a blowhole that's an important part of traditional Hawaiian heritage. Early Hawaiians called blowholes puhis and an ancient legend chronicles the story of a giant lizard or mo'o that got caught in the puhi, shooting waves skyward as he struggled to escape. 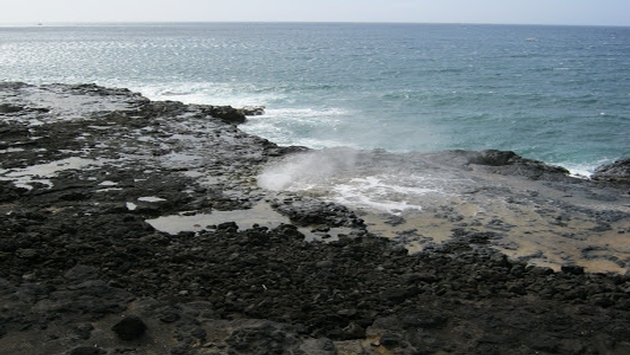 You can see spouting water as soon as you get near the park, which formed when waves eroded the underside of the rock and bore through the top portion. Water rushing through the narrow opening shoots out and streams toward the sky. It was a fascinating spectacle and I felt the spirit embodied by centuries of rituals that surround the hole. I biked to Prince Kuhio's Birthplace & Park, which is an essential part of Kauai history, since he did so much to preserve Hawaiian heritage. The park is a lovely stretch of greenery accented with a pond and a bronze statue that marks Prince Kuhio's birthplace in Koloa. PHOTO: Prince Kuhio's Birthplace & Park. My next stop was Pa'u a Laka or Moir Gardens, which is celebrated as one of the world's best tropical gardens. Brimming with vivid orchids and a lava rock pond covered with lily pads, it literally looks like the Garden of Eden. The garden hosts cacti and plants that are unusual for Hawaii. It was one of my favorite spots on the trail. The Poipu Park Beach is probably one of the most visited sites on the trail because it's the home of endangered Hawaiian monk seals, green sea turtles and humpback whales. The beach was where ancient Hawaiians fished and harvested salt. I was thrilled to catch a seal sunning on a rock at the shoreline. Visitors can't come too close to the seals but I was close enough to see that it was happy and comfortable in its sunbathing spot. I stopped by the Koloa Missionary, which is a homestead founded on the island in 1842 and the Sugar Monument, a beautiful bronze sculpture that commemorates the ancient Polynesians who first brought sugar cane to Hawaii. It also marks the first sugarcane plantation, as well as the workers who came from many countries to work in the industry. My last stop was the Makawehi and Pa'a Dunes, which required a strenuous bike ride and hike up the dunes, but it was well worth it. I hiked to the top of the lithified sand dunes and absorbed the stunning panorama of the Kauai coastline. Even though getting there required the most work, the dunes was my ultimate favorite stop on the trail.